To illustrate his point, the 46-year-old Charlotte resident reaches into an enormous pile of dark, moist, ever-decaying organic matter thats ready to be used as fertilizer. 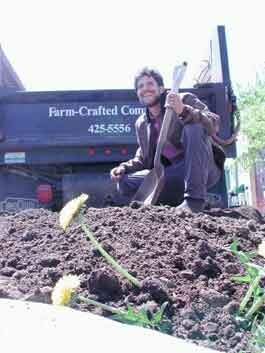 He holds out a handful of Wisbaums Farm-Crafted Compost, as if displaying precious jewels. Last spring, this looked like that, he says, gesturing at a nearby heap of cow dung. These before and after mounds are located at the University of Vermonts South Burlington farm, one of two ag operations that provide Wisbaums Champlain Valley Compost Company with a steady supply of ordure. The other source is a multigenerational family farm in Bridport. Wisbaum has two types of gigs. He does on-site custom composting for farms that either use it all or sell the surplus themselves. I can make compost at a fraction of what it would cost to buy and, if they sell some, that pays for my services, he says. Alternately, he sells the surplus himself and gives a percentage back to the originating farm, as is the case at the UVM and Bridport sites. His customers include nurseries, like Garden-side in Shelburne, and dozens of individual cultivators in Chitten-den County. On a recent sunny afternoon, Wisbaum drops in on the Stone-hedge development on Spear Street, where he has about 15 clients. Two of them greet him enthusiastically. Time is not actually something Wisbaum can afford to spare right now. Spring means waking up at 6 a.m. and getting to sleep no sooner than midnight. He makes dawn-to-dusk deliveries, followed by hours of business paperwork. Come June, the mighty Turner, which looks like a riding mower for giants, roars into action. Wisbaum will get around to almost 30 area farms throughout the area that take advantage of his custom composting. A lithe man with a sun-burnished, angular face, Wisbaum spends the better part of every day laboring in an odiferous salt-of-the-earth profession. With middle-class roots  in Niagara Falls, New York  and three older brothers who chose white-collar careers, how did the baby of the family wind up mired in manure? Wisbaum became the gardens assistant manager. After graduation, he worked as an environmental consultant in the hazardous and solid waste management industry for 12 years. But he always dreamed of returning to compost. In the San Francisco Bay area, he married Suzanne Lourie, a clinical social worker. They wanted to have children and live closer to their families, both based in upstate New York. So, in 1994, the couple moved to Vermont. They now inhabit a house insulated with straw bales at Ten Stones, an intentional community in Charlotte. With a loan from a banks socially-responsible investment fund, he purchased the $34,000 Turner, as well as a trailer to haul it from place to place and a truck. This equipment allowed Wisbaum to start custom composting for local farms  his original goal. When the scheme did not generate enough cash to make a living, he started selling the surplus to backyard gardeners: 50 cubic yards in 1996; 250 yards in 1997; 500 in 1998. Last year, he offloaded about 2000 cubic yards of the brown stuff from the back of his truck. Working both sides of the pile has put him in an ideal brokering position. Some organic vegetable farmers in Starksboro had no manure. I suggested they talk to a neighbor who usually has a surplus. I haul it, compost it for them, and theyll sell their excess, says Wisbaum, who also mixes and sells his own brand of topsoil. The cows, of course, eat the hay. Their milk is made into Shelburne Farms cheese, which Wisbaum enthusiastically consumes. What goes around, comes around. Thats good. Nobody wants exploding manure. Even his kids are getting something out of the process. Wisbaums 3-year-old son, Gabriel, often accompanies him on the delivery route. The boy enjoys poking a stick into the compost to encourage those friendly microbes to do their thing. Daughter Isabelle, 7, isnt quite as fascinated by her fathers occupation. But she and her brother nevertheless do enjoy a storybook that supports dads philosophy. Its title? Everyone Poops.